"Welcome to Winster, where friends help friends win FREE prizes." Poker Pals combines the challenge of Poker with the thrill of slots! Even if you've never played Poker before, you'll pick things up pretty quickly. Being able to see everyone's cards is a big help! If you're completely new, here's how the game works. You start out in a room with up to four other people, and each person has five cards to work with. 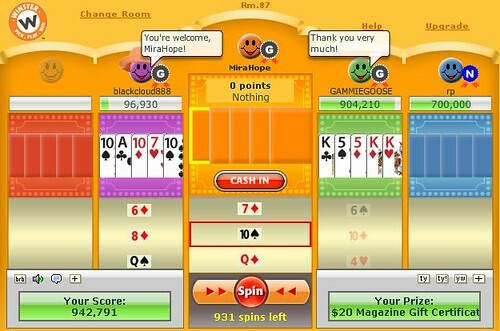 Instead of having a "dealer" to deal cards, you click "Spin." 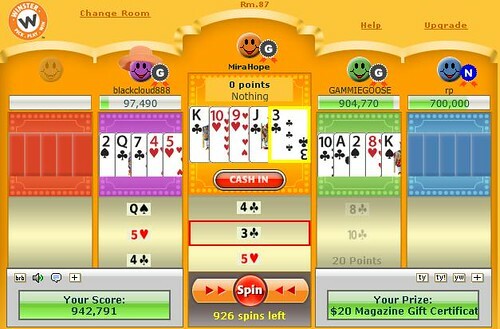 If your hand is empty you'll automatically get five cards and use five spins once you hit the button. Keep an eye on your neighbors' cards. They might have something you need! To start a trade, click on a card in your hand and then click on the card that you want. The other player will see a Yes/No balloon pop up next to the card you'd like to trade with them. When someone sends you a trade, you'll see the Yes/No balloon pop up next to the card they'd like to trade with you. Trading cards is the fastest way to earn points and friends! It's easy! Curious what everything is worth? Take a look at the table below! It lists the different hands, what they mean, and how much they're worth. Keep in mind that the pictures are just examples to give you an idea what to look for. A flush can be any suit! Oh, and don't forget that Club Winster members collect four times the points! When you're just starting out it can be tough trying to remember exactly what everything is. Here are a few different ways to think about Poker Pals terms. Straight: Imagine going straight down a road. The street numbers on the side generally go in order, such as 301, 302, 303, and so on. A Straight in Poker does the same thing! The order of cards is Ace, 2-10, Jack, Queen. King, and Ace again. Remember, Ace is both a high and low card! Flush: "He flushed with embarrassment when people discovered he had only one suit." All flushes use only one suit. It's a stretch, but it works! Full House: Do you remember the TV show Full House? Well, think of the three guys plus the Olsen twins. That's three of a kind plus a pair! 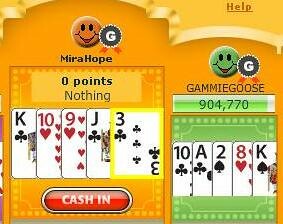 A Royal Flush is worth the most points but it' very difficult to get, even if you trade a lot! Most players settle for a Full House, 4 of a kind, or 5 of a kind. 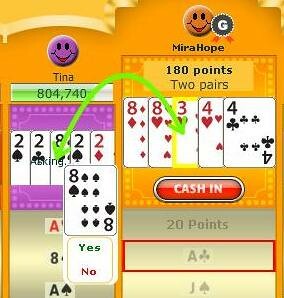 If you're looking at the cards in your hand and you have no idea what to do, start by looking for a pair. Don't have one yet? Check the other player's cards to see if anyone could help you out. If not, just pick a card and spin! When offering a trade please be courteous. If someone has 3-4 of a kind, don't send a trade and ask for one of their cards in the 3-4 group. Also, if someone repeatedly rejects your offer on a specific card, just move on. They're probably working on a combination that isn't clear to you. It's natural to be focused on your own cards. But once you're a little more comfortable with the game, start looking at other players' boards to see what they need. Pairs are easy to spot, so look for those first. Take a moment to see if anyone needs your card before you hit "Spin" and get rid of it! When you make an effort to help other players they'll make an effort to help you too! This basically combines tips 2 & 3. Take a look at the picture below. Right now neither player has anything valuable. But if they trade the ten of hearts for the King of spades, then both players end up with a pair. This is a great starting point! Now they both can work to turn their pairs into three of a kind or more. Say "Thank you!" and "You're welcome!" and say it often! At Winster we make it easy for everyone to be polite. Just hit the "ty" button to say "Thank you!" and the "yw" button to say "You're welcome!" It's such a simple thing to do but it makes a huge difference! If you never say "Thank you" you appear ungrateful, and people won't want to keep trading with you. Take a second to click the button and everybody wins! Now take your oodles of knowledge and go give Poker Pals a try! The merchants represented are not sponsors of Winster.com or otherwise affiliated with Winster.com. The logos and other identifying marks attached are trademarks of and owned by each represented company and/or its affiliates. Please visit each company's website for additional terms and conditions. © 2005-2019 Seaside Entertainment, LLC. All Rights Reserved.